The Church "Te Upiri" was built by Ihakara for his people about 1880 to celebrate 40 years of Christianity in the district. With the coming of the Pakeha and the sale of the Awahou Block to the Government in 1858, most of the Maori population had shifted across the river to the area known as Matakarapa. A marae was established with the church nearby. Over the years families moved back into Foxton and the Church fell into disrepair, eventually collapsing in a gale in the 1960's. 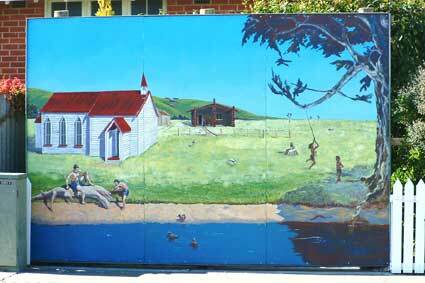 The carvings were removed to Kereru Marae and later to Canterbury Museum. Some are now on display at the Manawatu Museum.